It is Otseme’s seventh birthday and he is happily waiting for Daddy to return from work. He is excited because daddy promised to take him, his sister and their Mummy to have fun at the amusement park. But everything takes a dramatic turn when the family gets the news that Daddy was hit by a car on his way home. In haste, Mummy has to go and be with Daddy at the hospital, so Auntie Rose comes to help look after Otseme and his sister. But will the children be happy in Auntie Rose’s company? 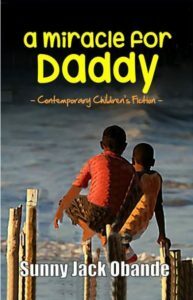 Will Daddy survive the accident? Will he be able to fulfill his promise to Otseme? And who is the mysterious man that promises Otseme a miracle?